I feel that the 2015 Rotterdam International Film Festival has laid down a marker in terms of quality and quantity of Japanese films, depth and breadth in subject matter and the people creating that content. What have the minds behind the Berlin International Film Festival programmed? In previous years it has had a strong selection of Japanese films and 2015 looks to be no different with a group that includes classics from Kon Ichikawa and new films from Sabu. The festival takes place from February 05th -15th and I think you will find this an interesting selection. I have mentioned this workshop film a number of times so here we go again. It comes from Cinema Impact, a workshop set up by Masashi Yamamoto in 2012 which has produced features and shorts like Be My Baby (2013). This particular feature film is based on a series of shorts about Zainichi (Koreans living in Japan) who are exploited by a religious sect. This one takes place in Korea Town in Tokyo where yakuza roam and is all about a Korean-Japanese woman named Minjon (Hyunri) who comes from a long line of shamans who speacialise in hearing messages from the water. She listens to people who are mostly outcasts and gives them a response in Korean which they are unable to understand. Believers keep seeking her out but she has misgivings about how she is exploited by businessmen who use her to found the God’s Water sect and wring money out of people. This group has built up around her and she is ready to leave it behind and do so through her Korean ancestry. 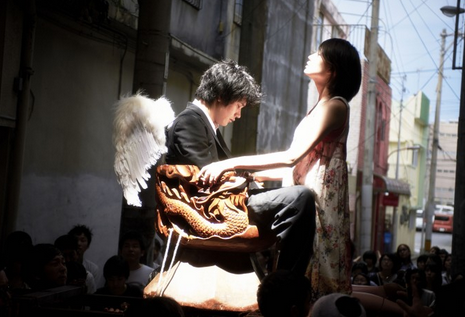 Daigo Matsui, directed a film called How Selfish I Am! (2013) which started life as a series of music videos that were turned into a full movie with the actors from those music videos taking on the lead roles. Has has done the same thing with this one which is based on two music videos by Seiko Oomori: “Midnight Seijun Isei Kouyuu” and “Kimi To Eiga.” Ai Hashimoto, Jun Aonami and Yu Inaba all appeared in the original music videos. This is all about a tight friendship between two girls who enjoy exploring popular culture and online culture and broadcasting their dreams and discoveries through their blogs. One girl is played by Ai Hashimoto who I know about from The Kirishima Thing (2012) and The World of Kanako (2014) while the other is Jun Aonami, a new actor. Shiori is 17, a goth-loli and blogger with a lot of followers who like watching her dive into make-up and fashion and her personal life online. When she meets a girl named Ayumi she discovers a shy and slightly odd fan who will soon become a major presence in her life because Ayumi has run away from home to stay with Shiori! 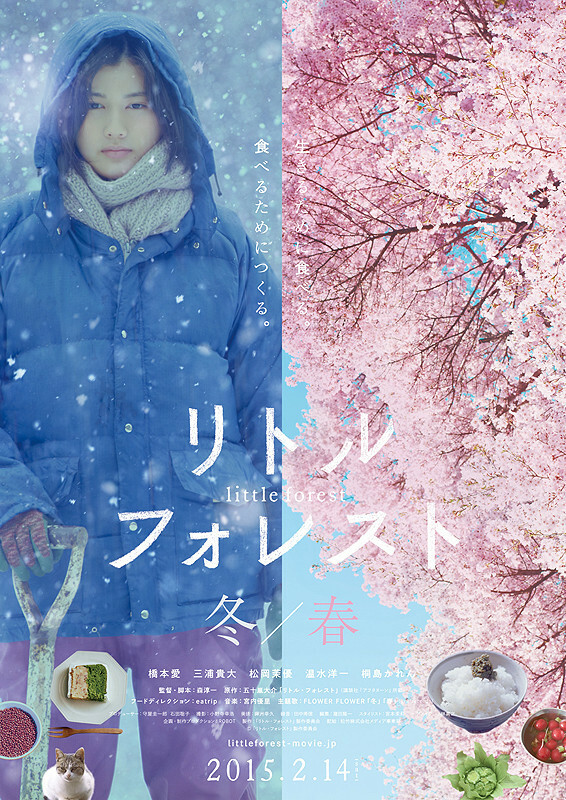 Little Forest is based on a popular manga by Daisuke Igarashi that was serialised in Monthly Afternoon from 2002 – 05. It was shot over the course of a year and is a 4 part film of four seasons. This is the second of the two films that has been programmed for this year’s Berlinale and is the “Winter” and “Spring” portion. It is due for release in February in Japan. 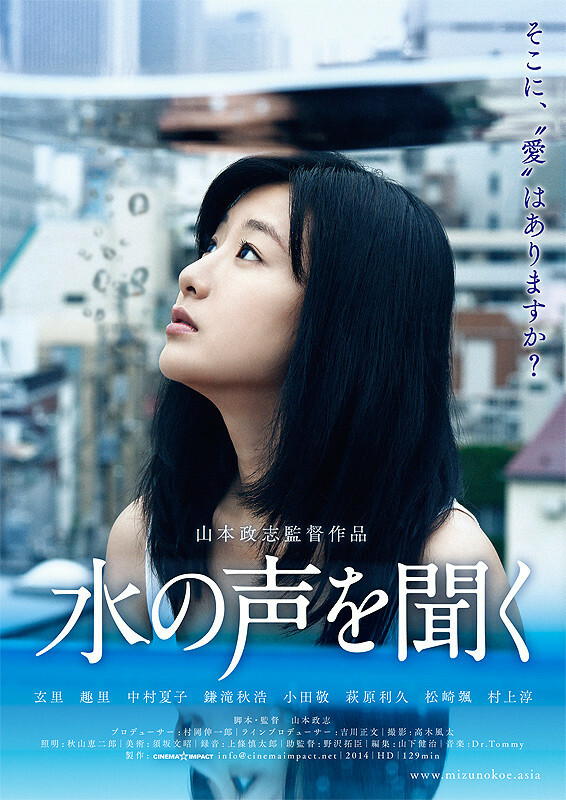 Ichiko (Hashimoto) leaves big city life and confusion behind to head back to the mountains where her hometown of Komori is located (in Tohoku prefecture) and she takes to living off the land. She grows and farms her own food and cooks meals all of which are dictated by the seasons and the things she collects in the mountains around her. This return to nature allows her to gain a new strength. This trailer starts out slow and picks up but the description on the festival site makes it sound bleak but uplifting: The films of Izumi Takahashi are populated by defeated people, people who are physically and psychologically maimed, who hurt one other and are even looking to be hurt themselves. But as wounded as they may be, they are also always looking for healing and for someone to make that possible. Here’s a trailer I found plus I the synopsis from the festival site. Traditional Japanese wooden Daruma dolls have no ears. 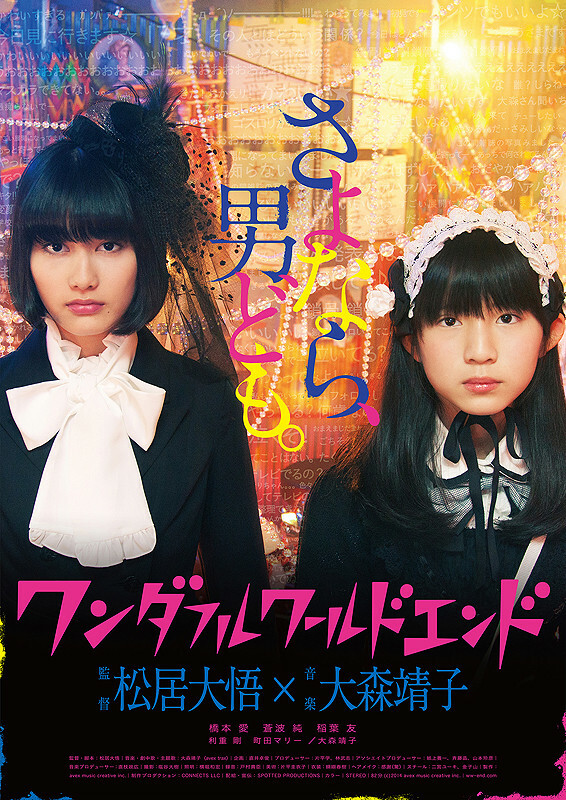 The classmates of this film’s hearing impaired heroine gave her the nickname ‘Dari Marusan’ in reference to such dolls. While Dari has now adopted the name as her own, she hasn’t got over the hurt. She has grown up and is now working for a detective agency that specialises in finding pets and she is on the case of a missing parrot. Her client is Yoshikawa (Hirosue), a severely traumatised man who keeps his distance from other people and thinks he has severed all links to the past. When the sensitive Dari and the gruff, inconsiderate Yoshikawa meet, old wounds resurface for the both of them. Another film by Sabu! This one is based on a novel he wrote, apparently. The festival site describes it like this: Oscillating between philosophy and buffoonery, Sabu’s film plays with famous motifs from film history, uniting melodrama, the gangster movie, romance and slapstick. His underlying idea, that every life has a value of its own, is special and in no way predictable and is presented with great pace and flamboyance. Looks like a good one! It stars Kenichi Matsuyama (Detroit Metal City) and the man, the legend, Ren Osugi (Exte). Things are hectic in heaven. Dozens of scribes sit before a long scroll writing the biographies of people down on Earth. What is invented by the men in heaven is lived out below. And their employer, God, is increasingly vehement in demanding avant-garde ideas. Take, for example, the beautiful Yuri (Ono), a girl who dies in a car crash. Some of the heavenly scribes find this very dull and send former gangster Chasuke (Matsuyama), who has become a heavenly tea-boy, back down to earth with instructions to save Yuri no matter what. And so Chas ends up in Okinawa, gets to know the earth-dwellers, interferes in their fates, becomes celebrated as ‘Mr Angel’ and is hounded by brutal enemies. His falling in love with Yuri is of course a foregone conclusion. But no one could anticipate what happens next. Not even God himself. 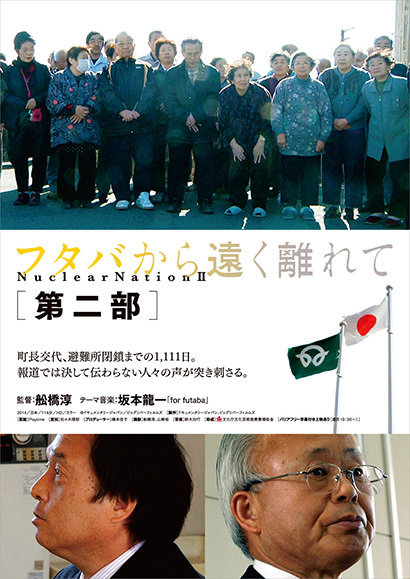 Atsushi Funahashi was at the 2012 Berlin Film Festival with his documentary Nuclear Nation, about the consequences of the March 2011 nuclear disaster in Fukushima Daiichi which displaced 1400 people from nearby Futaba. These people were evacuated to a school building in a Tokyo suburb and we saw how they survived. The sequel takes place some time after and we learn what happened to the people we saw in the first documentary. We see that the former mayor, a man who once advocated the use of nuclear energy and then became a passionate fighter for the victims of the catastrophe, has been replaced by someone younger. The single-minded cattle breeder who resisted government orders to kill his livestock which were in the disaster zone sees the consequences of radioactive contamination on the ravaged bodies of his animals. Also, those displaced by the disaster have just recently (as in late 2014) left the school building they were staying in but they’re unlikely ever to be able to return to their homes because the epicentre of the catastrophe has been declared a toxic waste disposal site. While many in the world may look away from what has happened to the people who suffered from the nuclear disaster, filmmakers like Atsushi Funahashi are keeping them in the news headlines by showing us their stories making this work valuble and insightful. Ichikawa plays around with illusion and reality and weaves them into a delirious widescreen work full of vivid colours. The action remains within the stylised stage setting; the boundaries between on- and offstage become blurred and repeatedly flow into one another. The soundtrack also draws on the same stylistic blend of tradition and modernity, moving effortlessly between Japanese classical music and suggestive jazz. 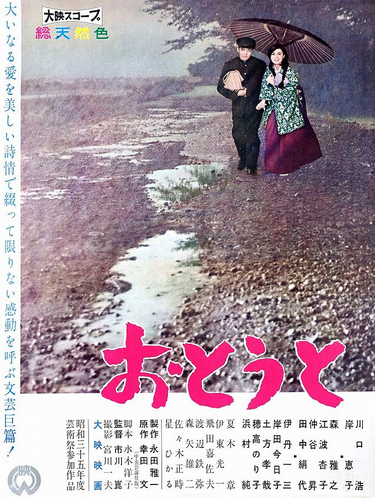 Her Brother is an award-winning film from Kon Ichikawa from 1960. It was remade by Yoji Yamada in 2010. I have seen the more modern version but I’m rather intrigued by this older one. Young Gen and her no-good brother Hekiro live with their father and stepmother. Due to the stepmother’s severe rheumatism, it’s Gen who does most of the work around the house. She’s also unceasingly loyal to her brother, a trouble-maker and rebel. Their mother, a pious Christian who feels the rest of the family doesn’t really accept her, often laments her poor health. The father never really listens to his family’s troubles, content to dole out platitudes when not remaining silent. The family’s fragile relationships only begin to heal when Hekiro becomes seriously ill. 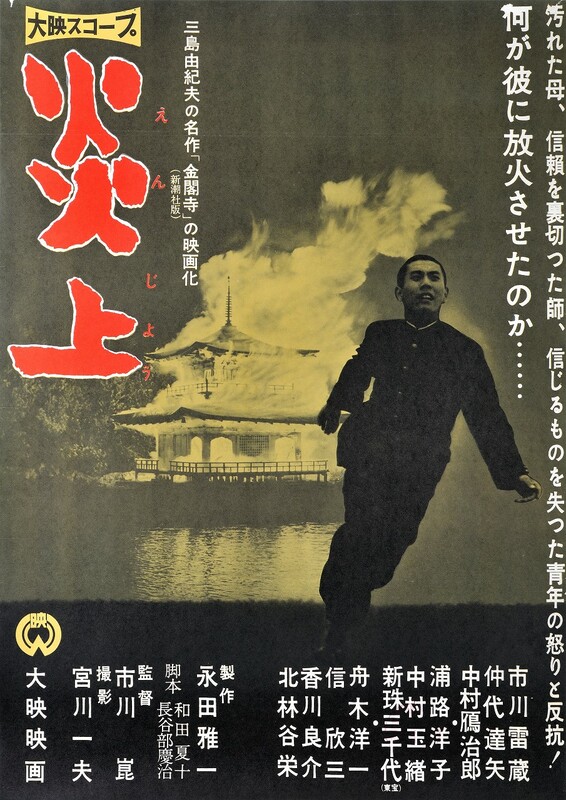 This complex psychological study of an outsider is based on Yukio Mishima’s book “The Temple of the Golden Pavilion”, which was inspired by the burning of a national shrine in 1950. I found the film poster at this site which has other entries for films from the ‘60s. I found this six minute clip from the film. Only two shorts: Shape Shifting (Dir: Elke Marhöfer, Mikhail Lylovm Dur: 18 mins.) 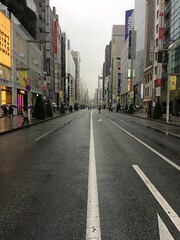 is a co-production between Germany and Japan that explores human and non-human impact on the natural world. Maku (Dir: Yoriko Mizushiri, Dur: 6 mins.) is an animated exploration of the interactions between two people which looks to run the gamut fom sweet and tender to fearful. It’s all relayed via pastel-coloured animation and flowering movements which create sensual and emotional visuals that are made more powerful by the accompanying sounds. The festival page has a short excerpt from the film. Her Brother looks very intriguing to me. Hopefully that’s going to be one you watch and review at some point?? I think I’d get around to watching Her Brother as part of a Kon Ichikawa season. I have watched the 2010 remake by Yoji Yamada which was a solid film. I’m hoping that The Voice of Water comes to the UK. It had a quiet release in Japan last year but the reviews were good and it’s now on its international film festival run. Ten no Chasuke sounds like a very interesting idea. I’ll keep and eye out for that film. It sounds very interesting and it’s an original idea from a great director! I’m eager to see this. It might show up at the Edinburgh International Film Festival.